Researchers have reviewed evidence for wildlife disturbance and current drone policies and found that the law is playing catch-up with emerging technology. The drone market is booming and it is changing the way we use airspace, with some unforeseen consequences. The uptake of remotely piloted aircraft (RPAs) has been swift. But despite their obvious benefits, concerns are growing about impacts on wildlife. In our research we investigate whether regulation is keeping pace with the speed of technological change. We argue that it doesn’t, and we suggest that threatened species might need extra protection to ensure they aren’t harmed by drones. Drones are useful tools for conservation biologists. They allow them to survey inaccessible terrain and assist with many challenging tasks, from seeding forests to collecting whale snot. But researchers are also discovering that RPAs have negative impacts on wildlife, ranging from temporary disturbances to fatal collisions. Disturbance from vehicles and other human activity are known to affect wildlife, but with the speed that drones have entered widespread use, their effects are only just starting to be studied. So far, the regulatory response has focused squarely on risks to human health, safety and privacy, with wildlife impacts only rarely taken into account, and even then usually in a limited way. It is not uncommon for regulatory gaps to arise when new technology is introduced. The rapid growth of drone technology raises a series of questions for environmental law and management. We have reviewed evidence for wildlife disturbance and current drone policies and found that the law is playing catch-up with emerging technology. Impacts on wildlife range from disturbance to fatal collisions. This is particularly important in New Zealand, where many threatened species live outside protected reserves. 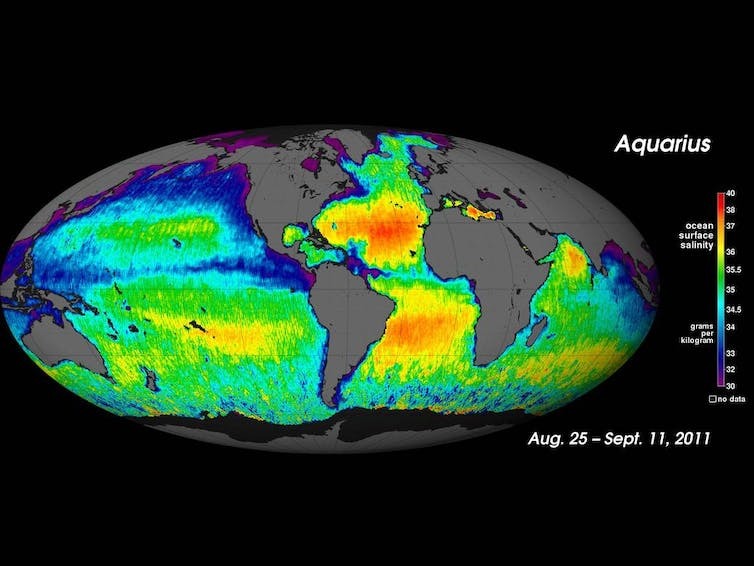 Coastal areas are of particular concern. They provide habitat for numerous threatened and migrating species but also experience high rates of urban development and recreational activity. Different species also respond very differently to the invasion of their airspace. Where “flying for fun” and pizza delivery by drone combine with insufficient control, there is potential for unanticipated consequences to wildlife. When competing interests collide, regulation requires particular care. Any rules on RPAs need to cater for a wide range of users, with varying skills and purposes, and enable beneficial applications while protecting wildlife. There are strong social and economic drivers for the removal of red tape. Australia and the United States have introduced permissive regimes for lower-risk use, including recreational activity. In New Zealand, RPAs are considered as aircraft and controlled by civil aviation legislation. Wildlife disturbance, or other impacts on the environment, are not specifically mentioned in these rules and control options depend on existing wildlife law. The lack of consideration of wildlife impacts in civil aviation rules creates a gap, which is accompanied by an absence of policy guidance. As a consequence, the default position for limiting RPA operations comes from the general requirement for property owner consent. 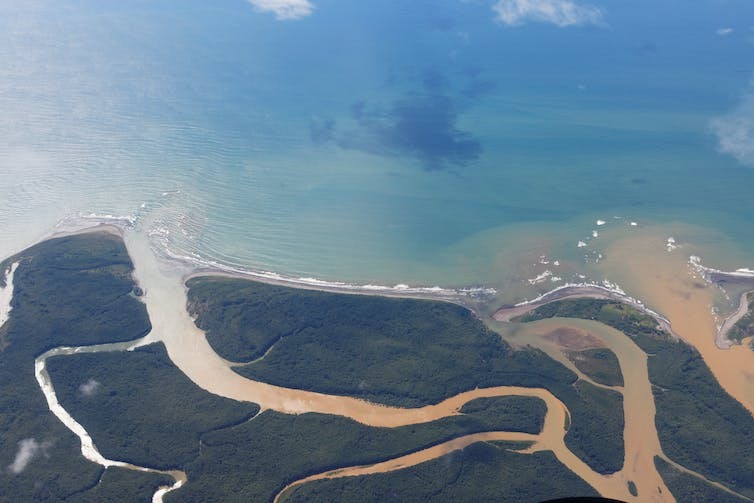 RPA operators wanting to fly over conservation land have to get a permit from the Department of Conservation, which has recognised wildlife disturbance as a potential issue. On other public land, we found that local authorities take a patchy and inconsistent approach to RPA activity, with limited consideration of effects on wildlife. On private land, efforts to control impacts to wildlife depend on the knowledge of property owners. Protection of wildlife from RPA impacts is further confounded by limitations of legislation that governs the protection of wildlife and resource use and development. The Wildlife Act 1953 needs updating to provide more effective control of disturbance effects to species. Marine mammals get some protection from aircraft disturbance under species-specific legislation. Other than that, aircraft are exempt from regulation under the Resource Management Act, which only requires noise control for airports. As a result, tools normally used to control spatial impacts, such as protective zoning, setbacks and buffers for habitat and species are not available. This makes sense for aircraft flying at 8,000m or more, but drones use space differently, are controlled locally, and generate local effects. It is also clear that equipment choices and methods of RPA operation can reduce risks to wildlife. Dunedin City Council in New Zealand recently approved a bylaw banning drones from ecologically sensitive areas. This is a good start but we think a more consistent and universal approach is required to protect threatened species. As a starter, all RPA operations should be guided by specific policy and made available on civil aviation websites, addressing impacts to wildlife and RPA methods of operation. In addition, we advocate for research into regulatory measures requiring, where appropriate, distance setbacks of RPA operations from threatened and at risk species. Distance setbacks are already used in the protection of marine mammals from people, aircraft and other sources of disturbance. Setbacks benefit species by acting as a mobile shield in contrast to a fixed area protection. Congestion of space is a condition of modern life, and the forecast exponential growth of RPA in the environment indicates that space will become even more contested in future, both in the air and on the ground. We argue that stronger measures that recognise the potential impacts on wildlife, how this may differ from species to species, and how this may be concentrated in certain locations, are required to deliver better protection for threatened species. As the first core samples from Zealandia emerge, chief scientists Rupert Sutherland and Jerry Dickens explain what that means for the continent’s evolution. 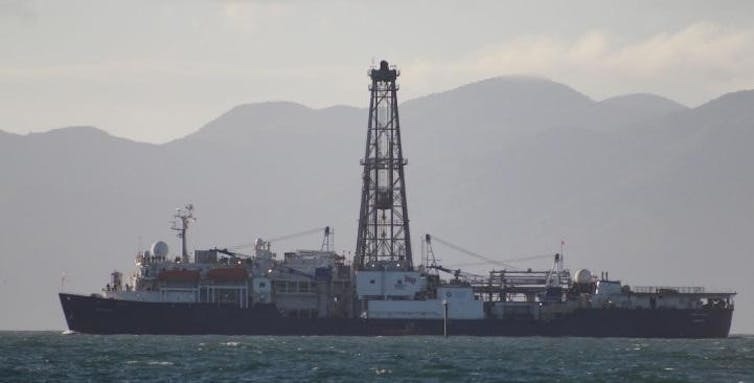 IODP research vessel Joides Resolution leaving Townsville in July at the start of its voyage to Zealandia. 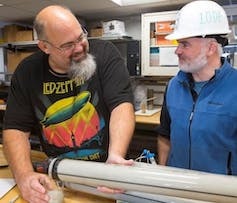 Co-chief scientists Jerry Dickens (left), Rice University, USA, and Rupert Sutherland (right), Victoria University of Wellington, New Zealand, drain excess sea water from a newly-collected sediment core. We are re-writing the geological history of Zealandia on our voyage. 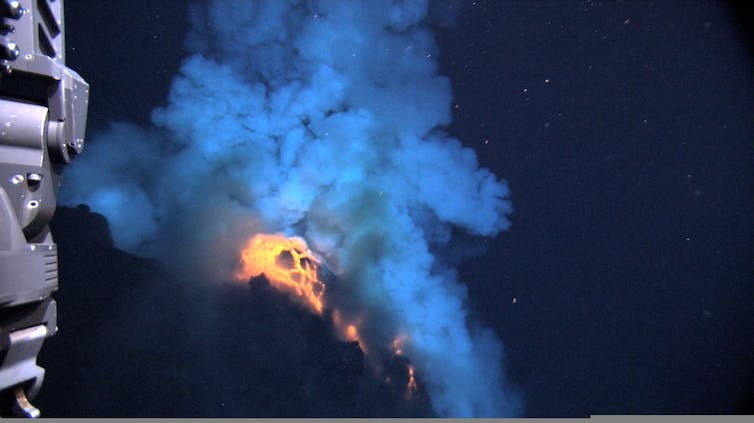 Zealandia was first recognised about 50 years ago and ideas for how it formed were published then, but the only previous expedition that has drilled deep enough into the seabed to collect useful evidence was undertaken in 1971. It appeared back then that Zealandia separated from Australia and Antarctica about 80 million years ago, when dinosaurs roamed the Earth. It then subsided deep beneath the waves and was lost. 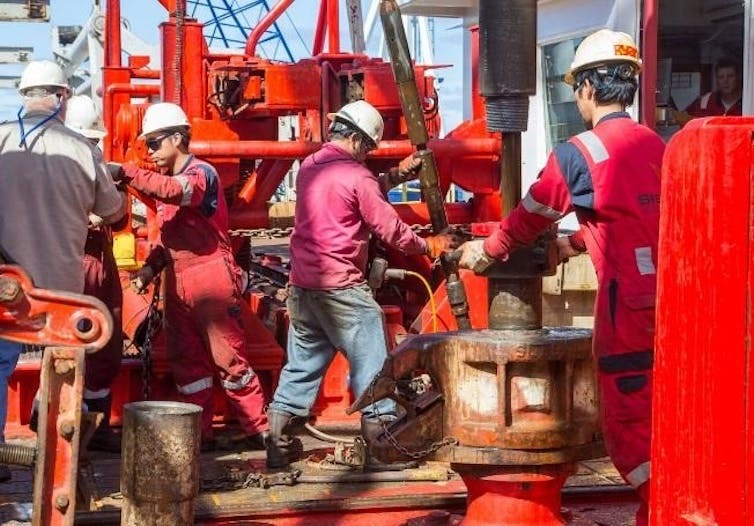 To collect sediment cores from deep beneath the seabed we need a drill that may be more than 5000 metres long and weigh more than 200 tonnes. 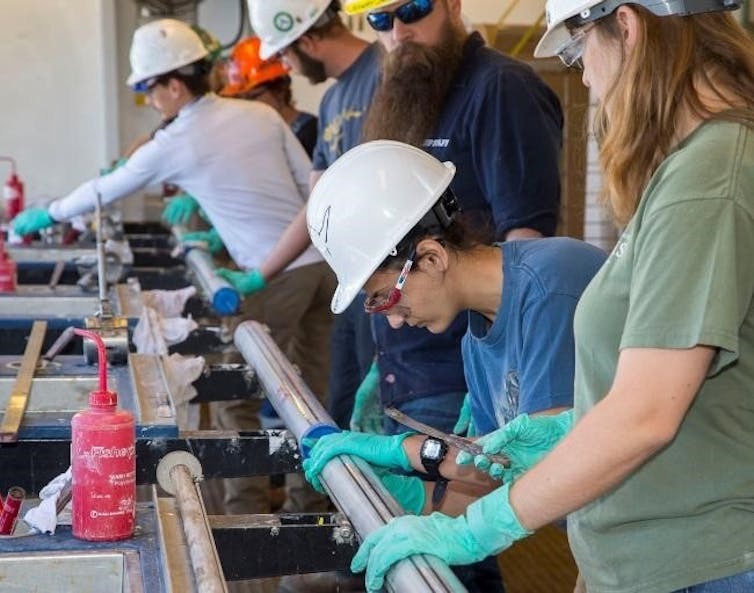 Texas A&M University technical staff process a recently-collected sediment core.